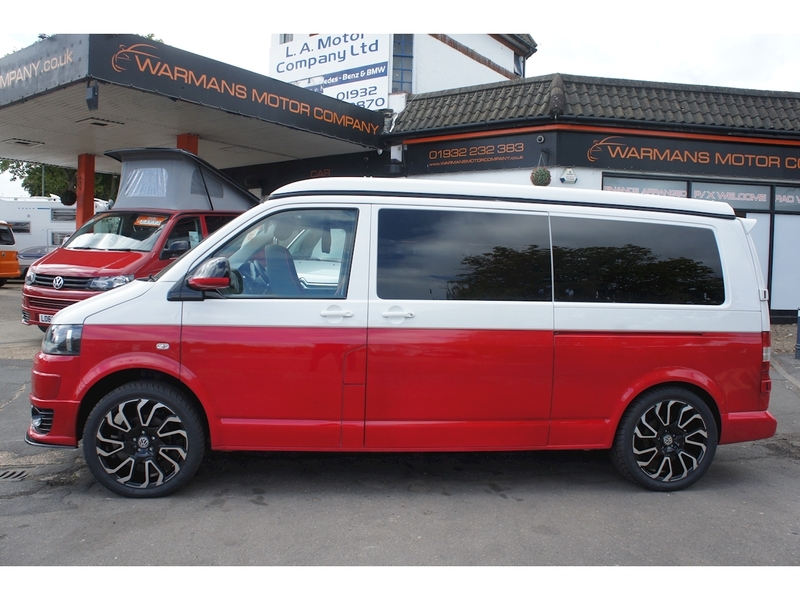 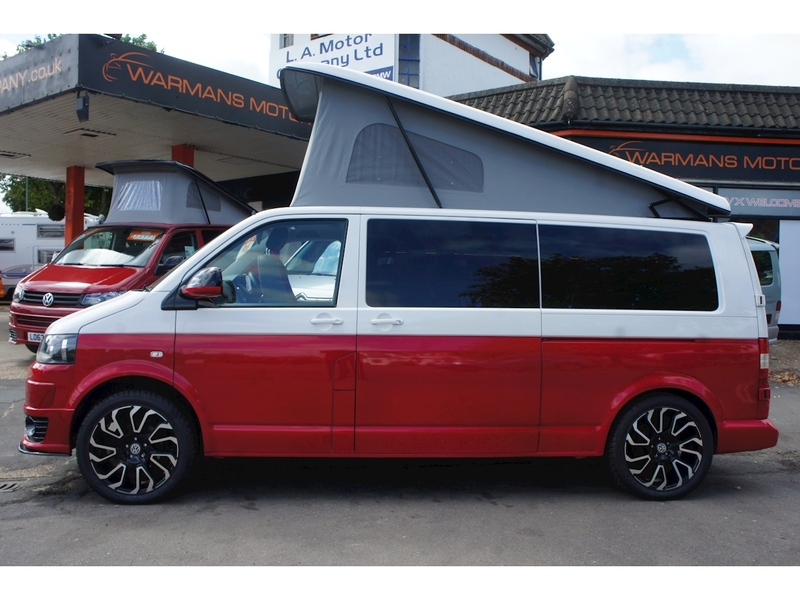 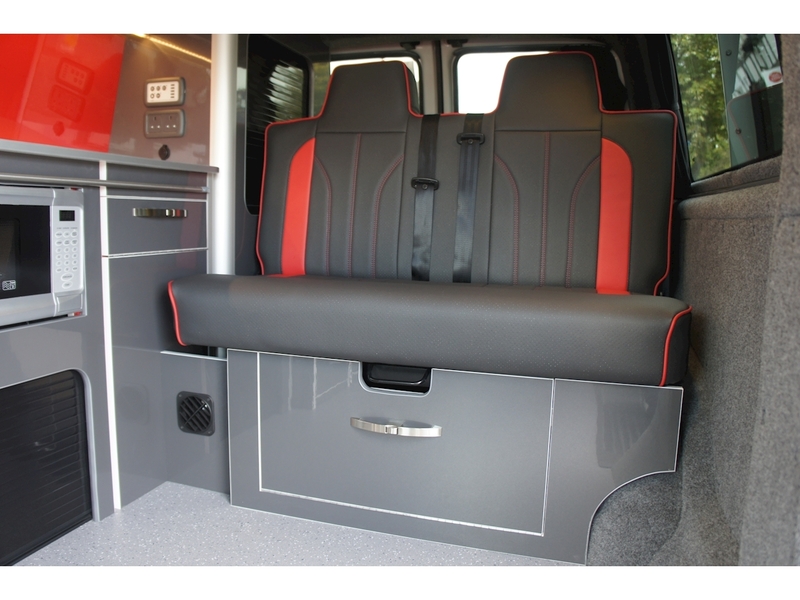 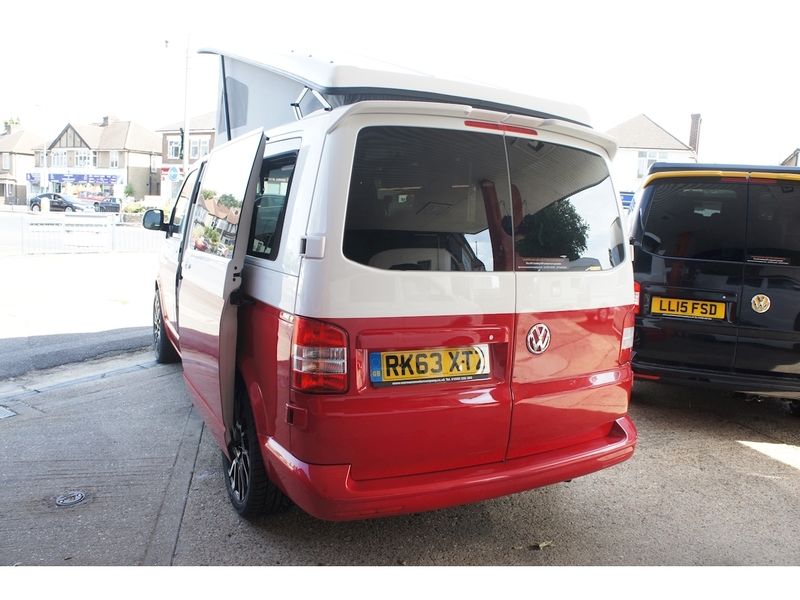 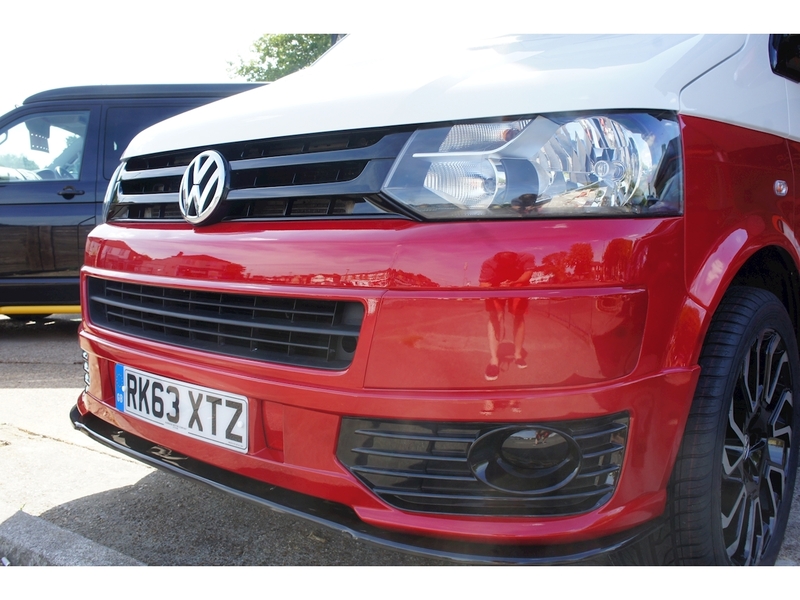 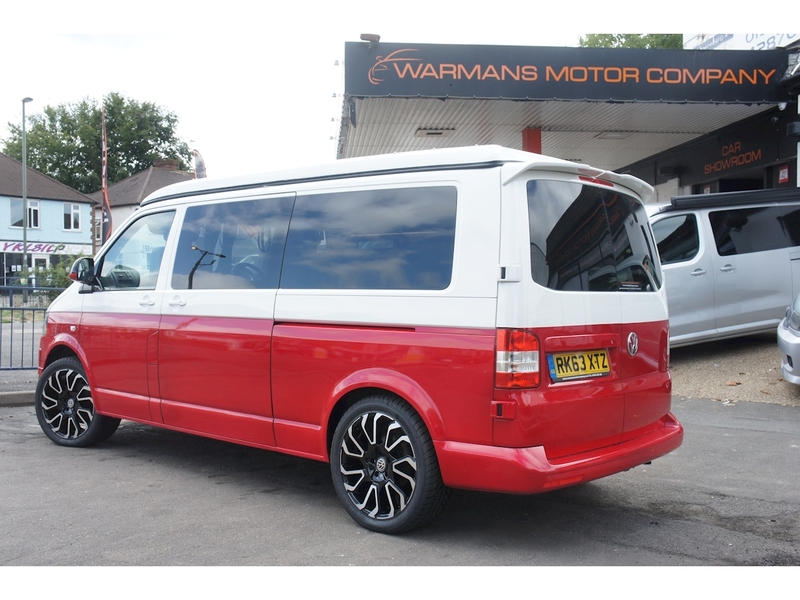 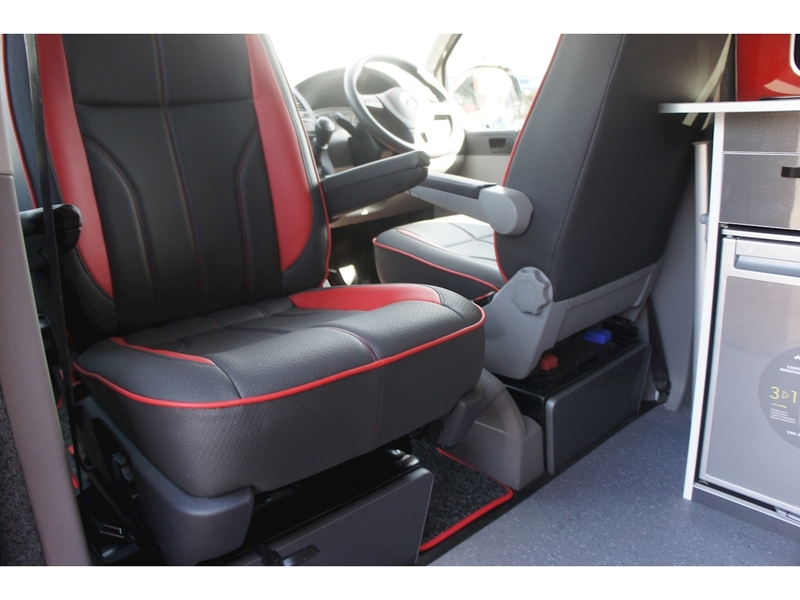 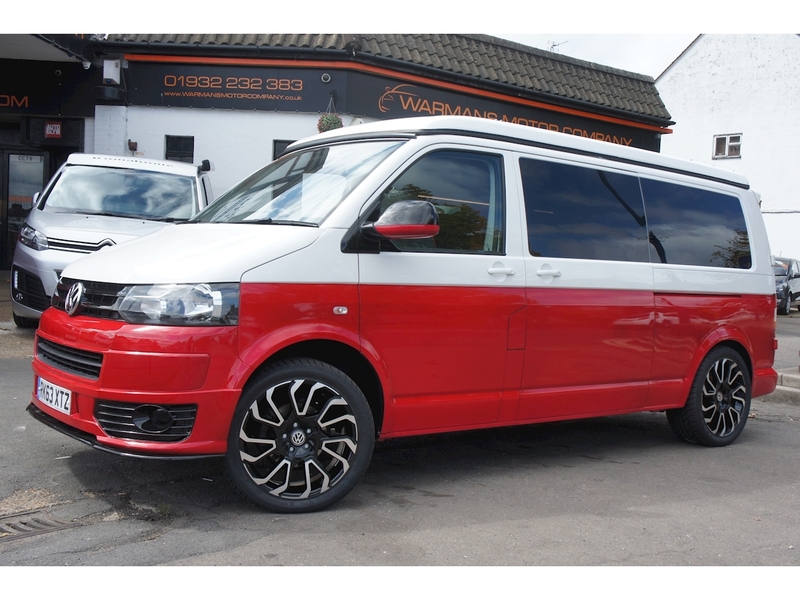 VW TRANSPORTER T5 LWB WITH CAPTAIN SEATS AND BARN DOORS!! 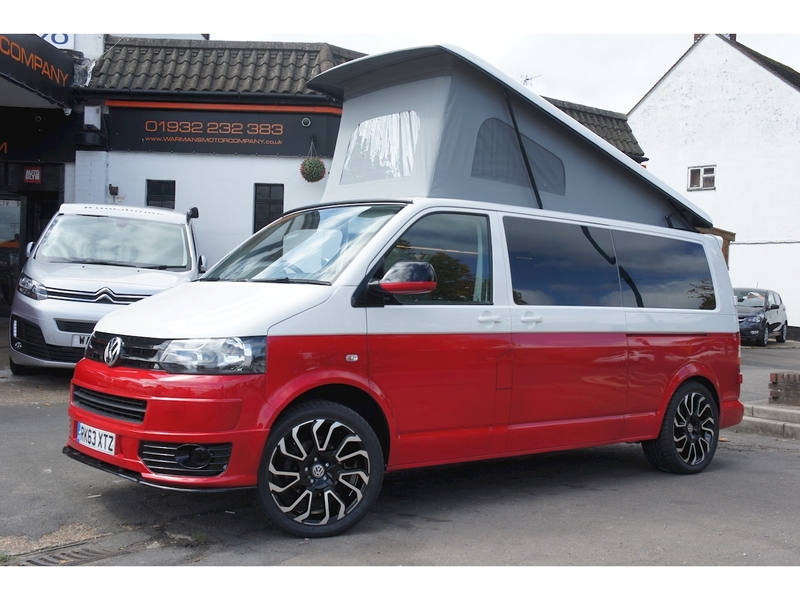 4 BERTH. 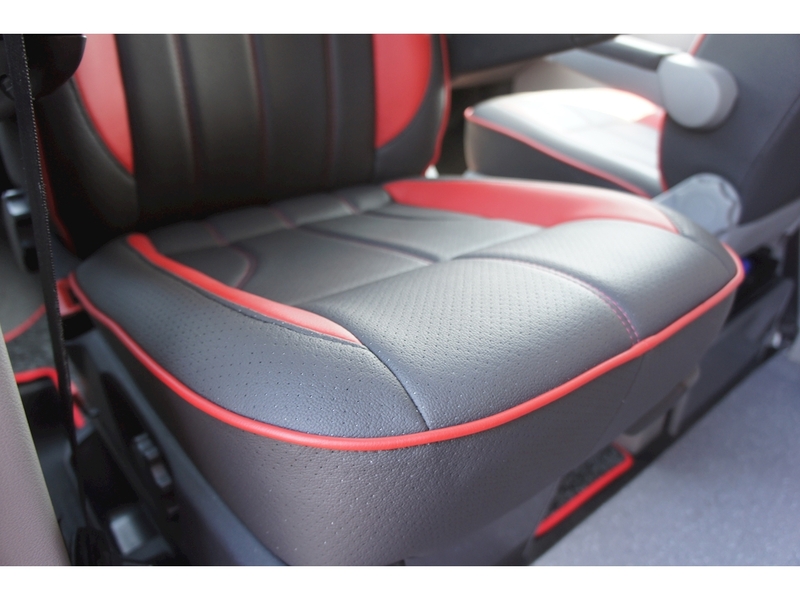 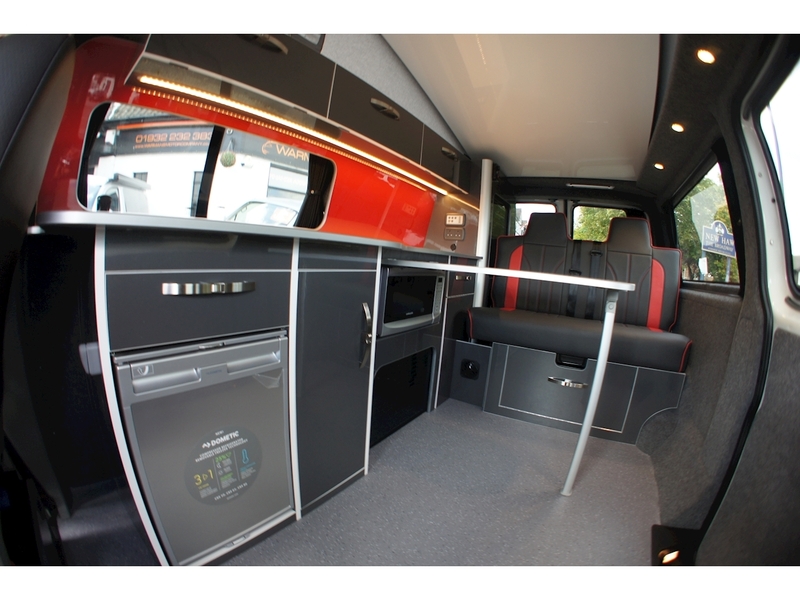 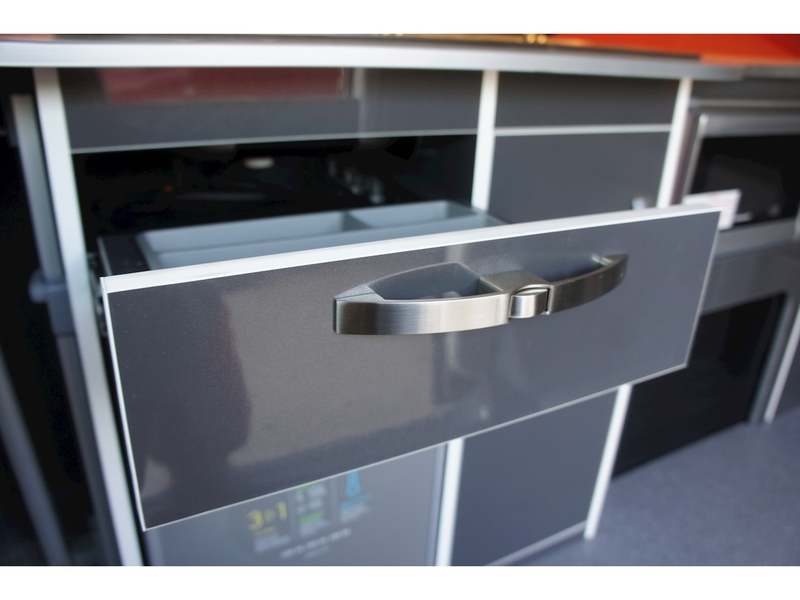 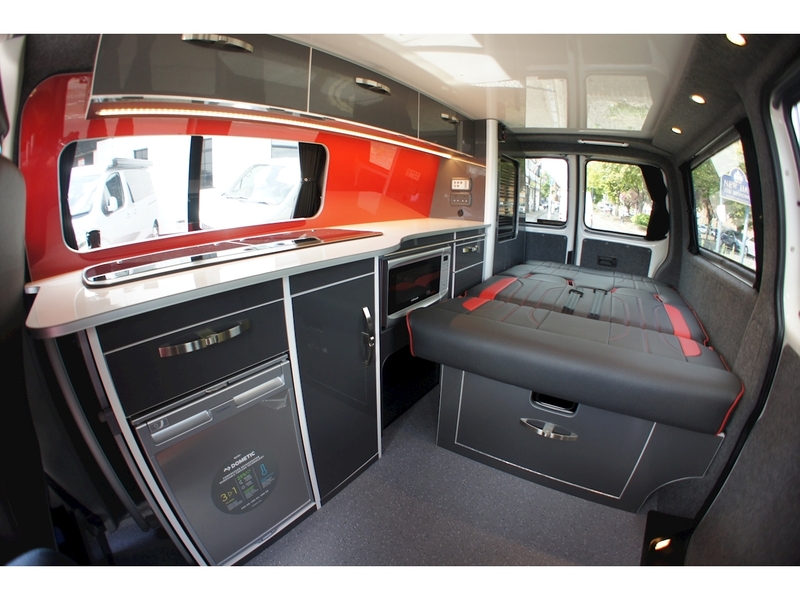 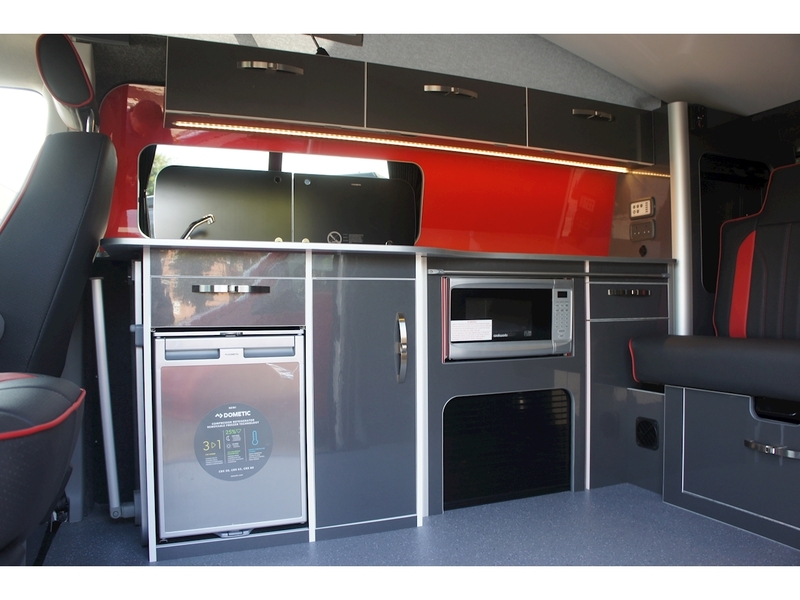 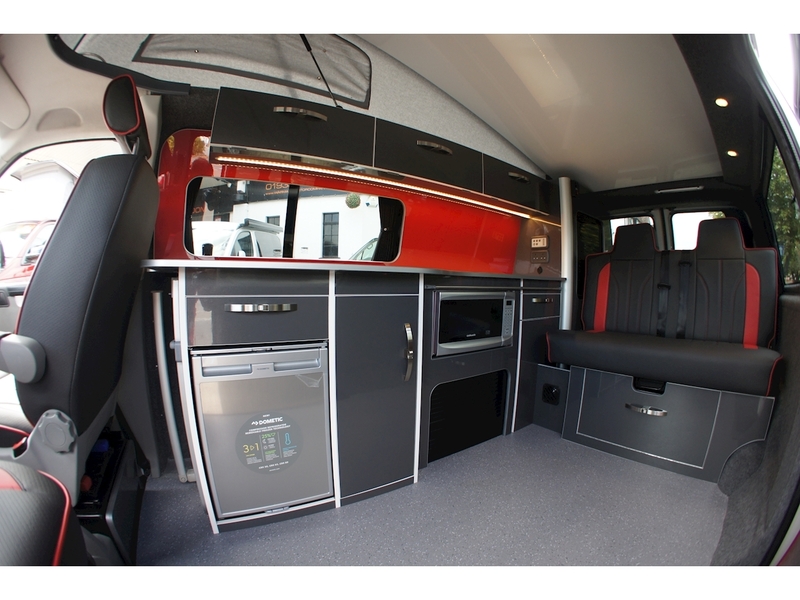 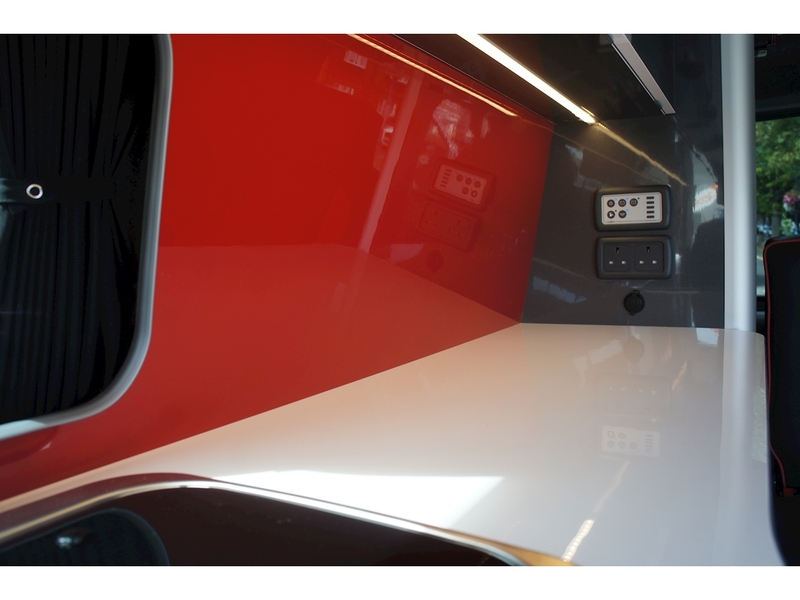 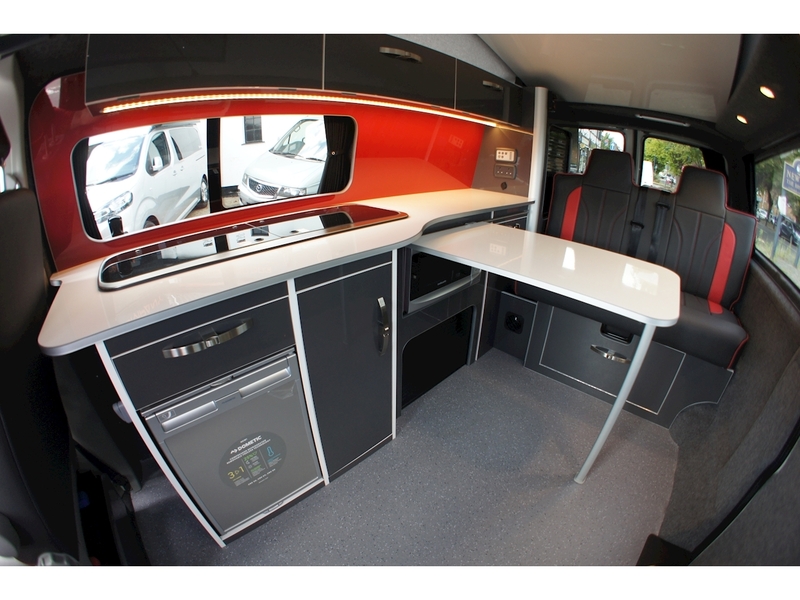 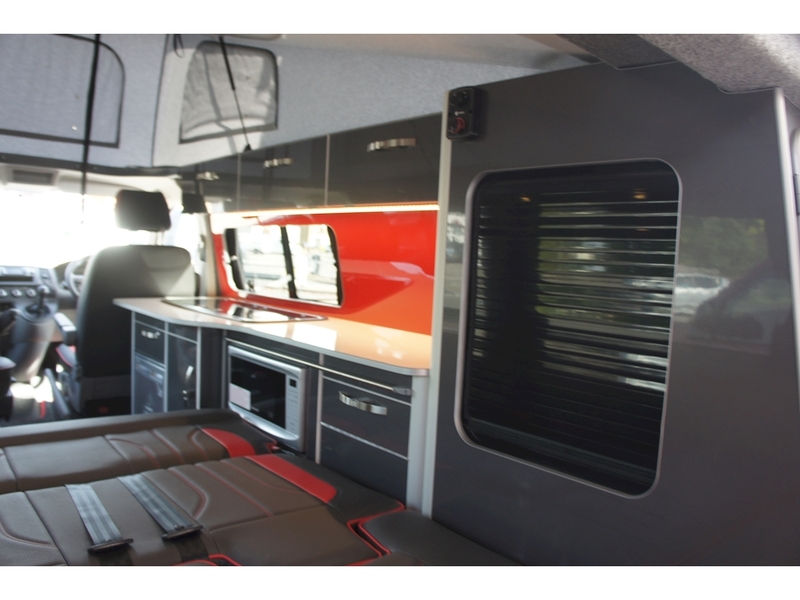 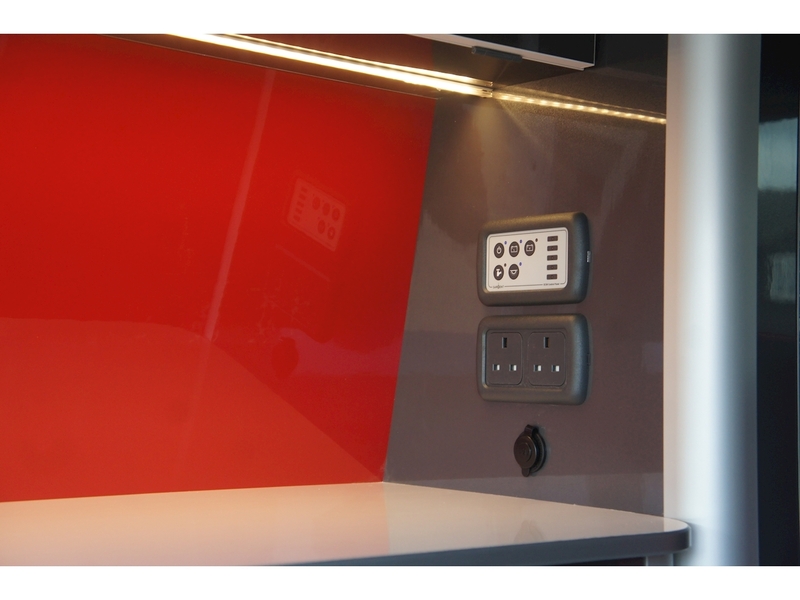 RECENTLY UNDERGONE A FULL CONVERSION INCLUDING CONTEMPORARY WHITE HIGH GLOSS WORKTOPS WITH RED SPLASH BACK, GREY HIGH GLOSS UNITS WITH RED TRIM, AND BLACK LEATHER SEATS, WITH COMPLIMENTARY RED INSERTS AND MATCHING ROCK AND ROLL BED. 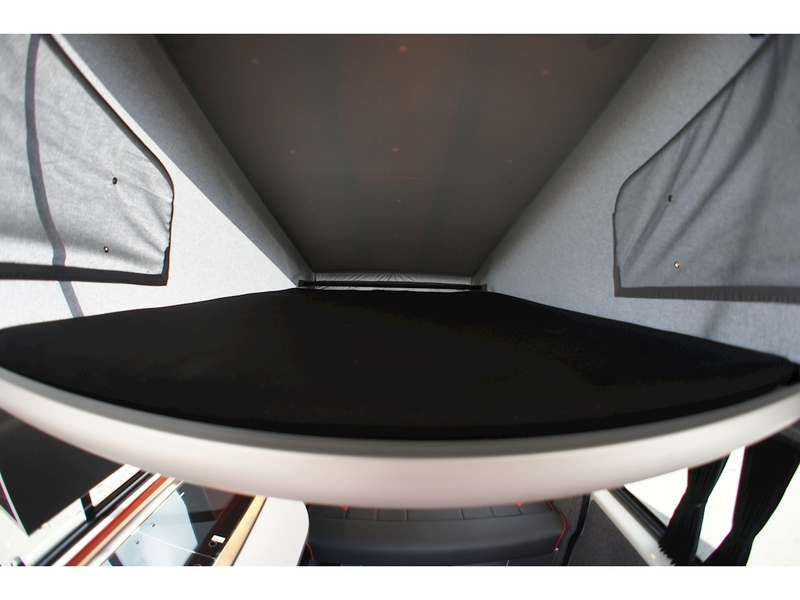 THE BED CAN EASILY ACCOMMODATE 2 ADULTS TO SLEEP COMFORTABLY, BUT THERE IS ALSO THE BENEFIT OF THE HIGH QUALITY POP-TOP ROOF, COMPLETE WITH MATTRESS, TO ENABLE 2 MORE PEOPLE TO SLEEP UP TOP. 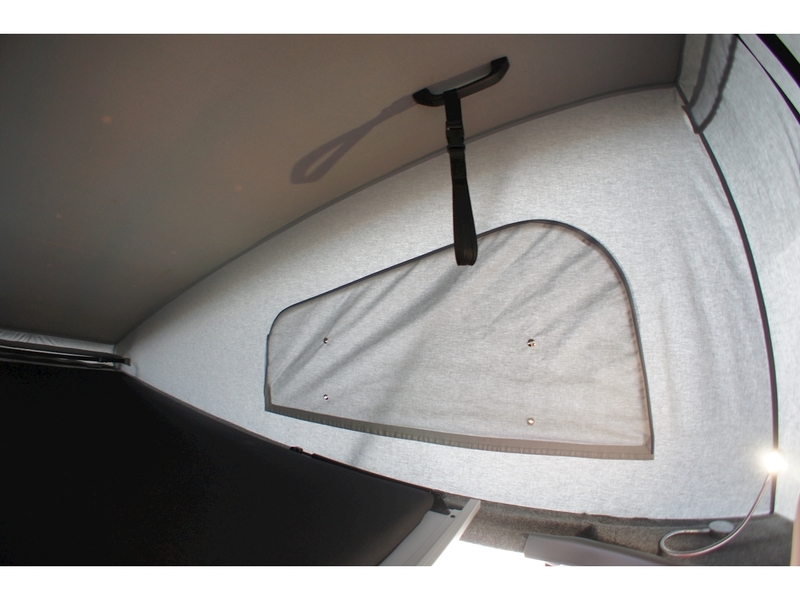 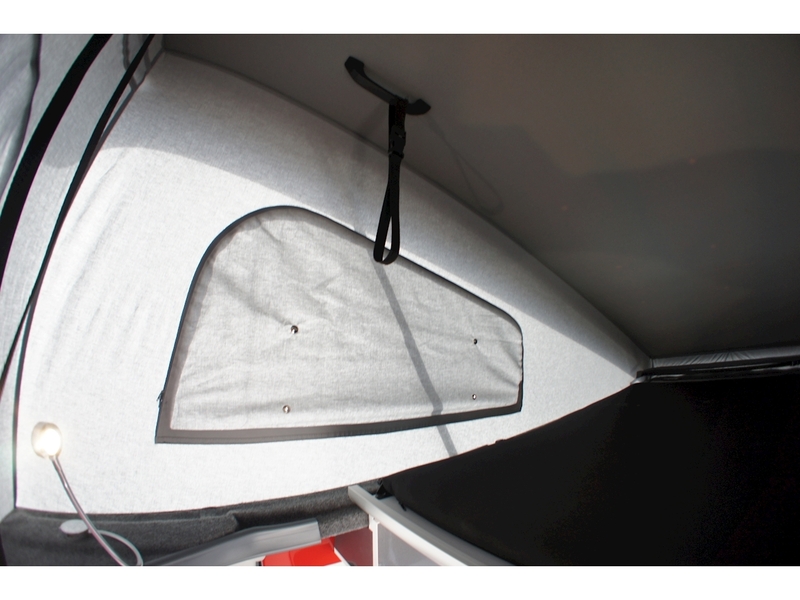 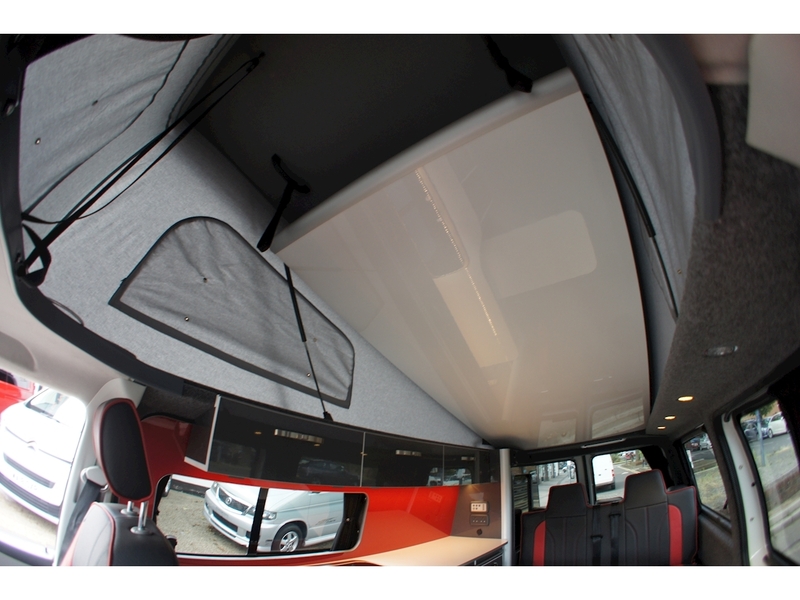 THE ROOF FRONT AND SIDES ARE MADE FROM SUPERB QUALITY BREATHABLE COTTON, WITH A FRONT BUILT IN CLEAR WINDOW AND 2 SIDE MESH WINDOWS TO ALLOW IN AMPLE LIGHT IN. 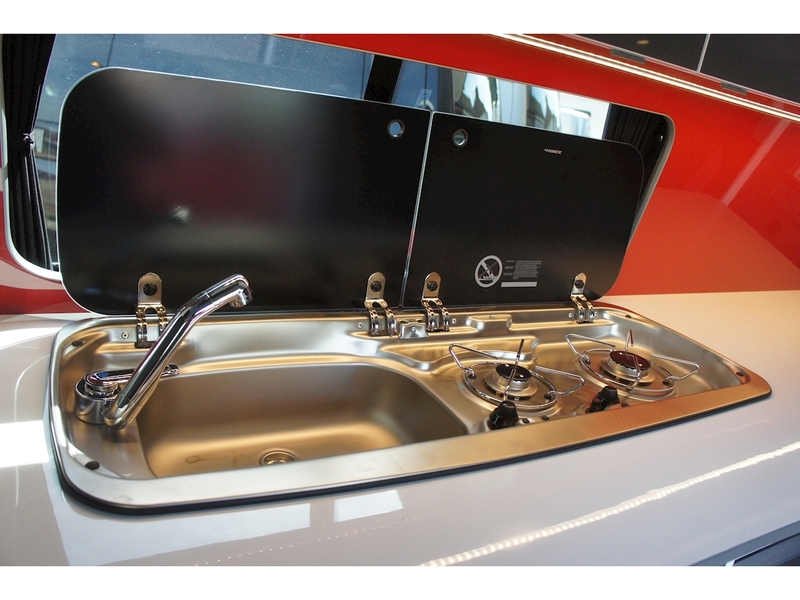 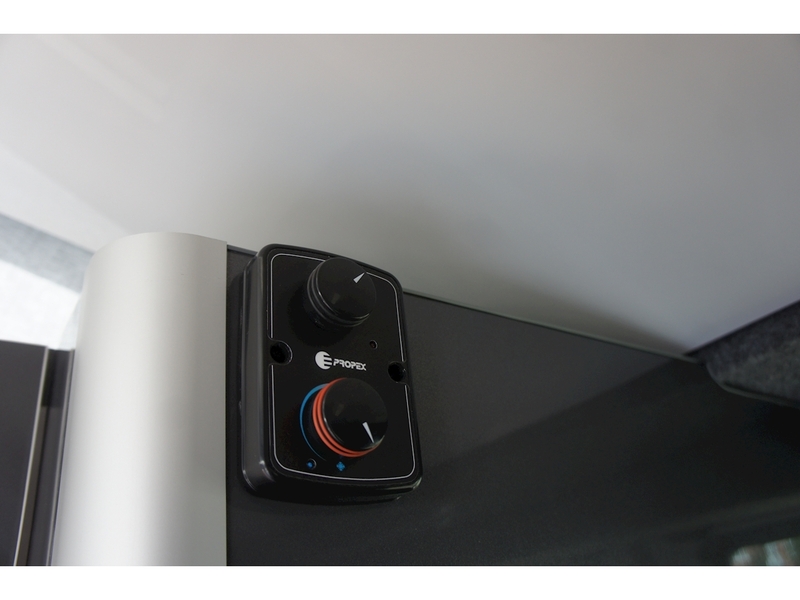 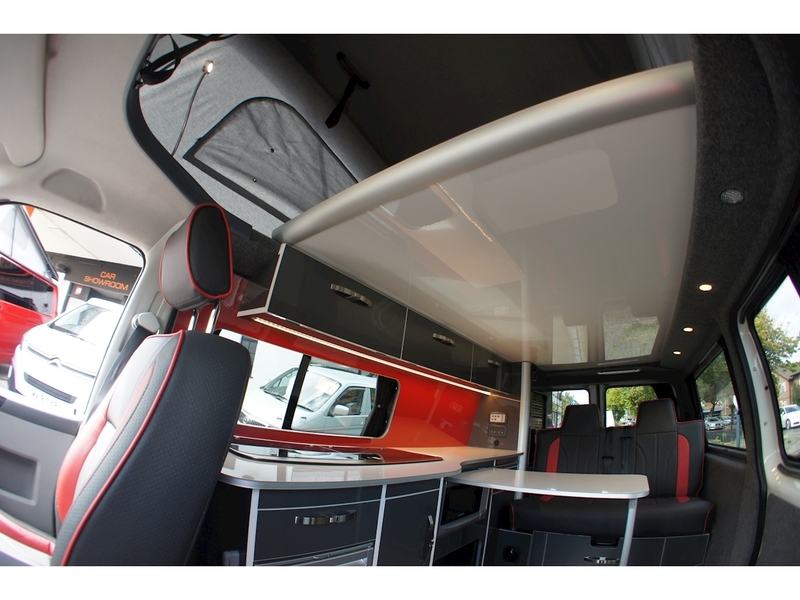 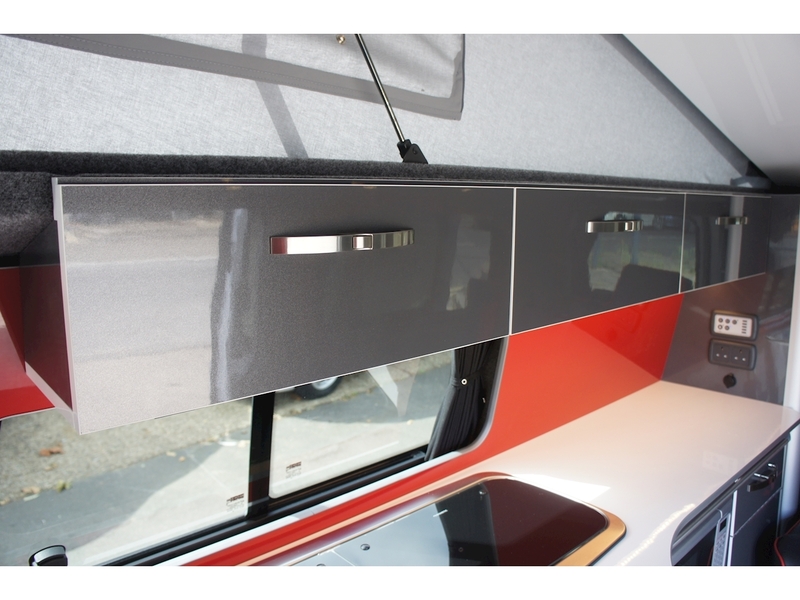 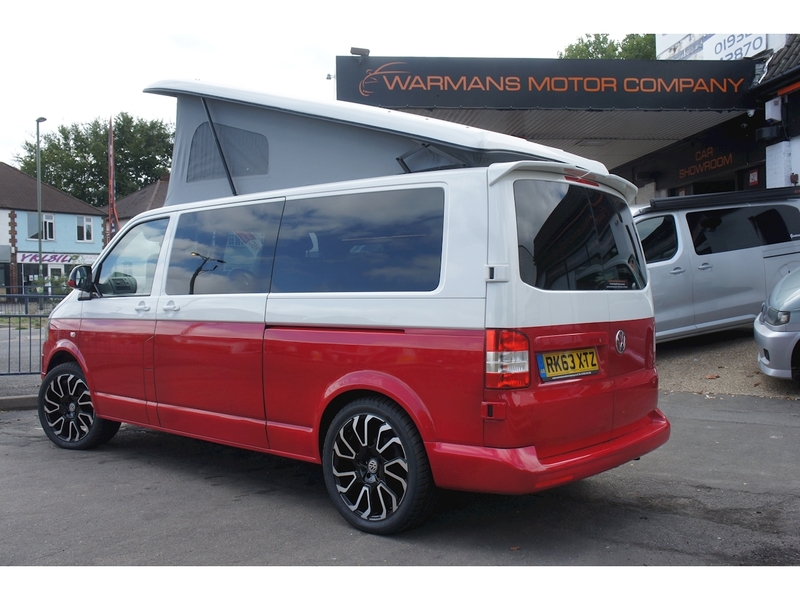 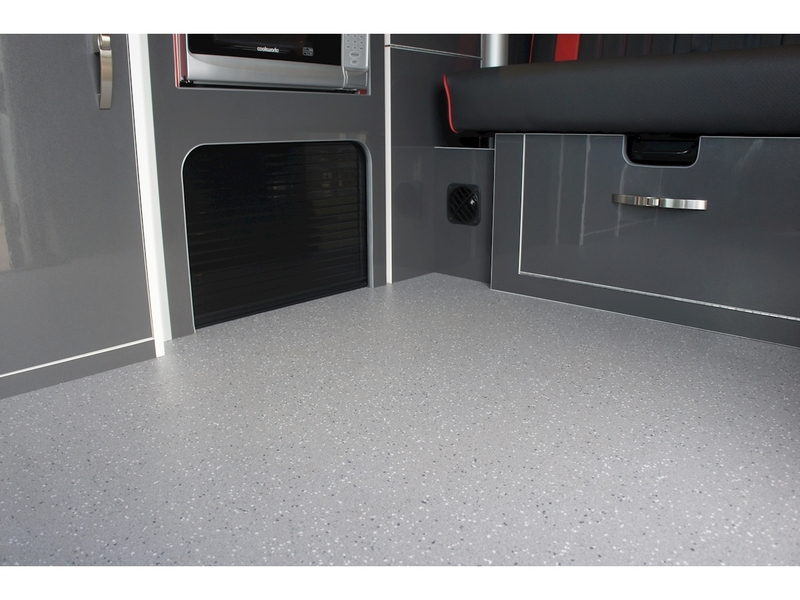 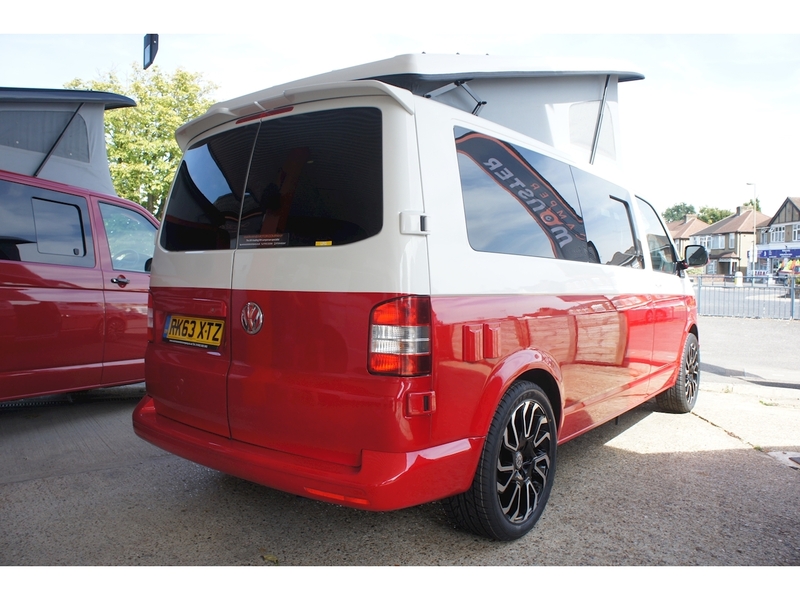 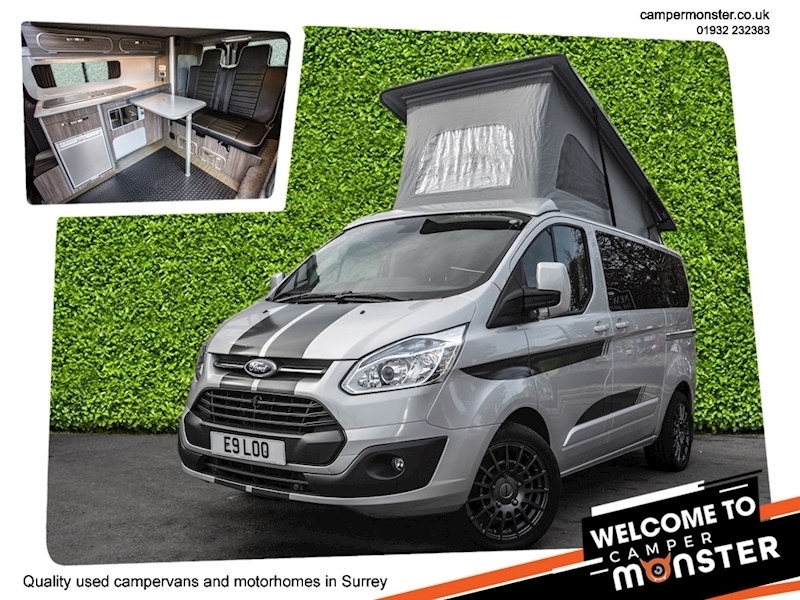 BUILD QUALITY & CUSTOMER SERVICE IS WHY WE ARE 1 OF THE MOST SUCCESSFUL CAMPER RETAILERS IN THE UK! 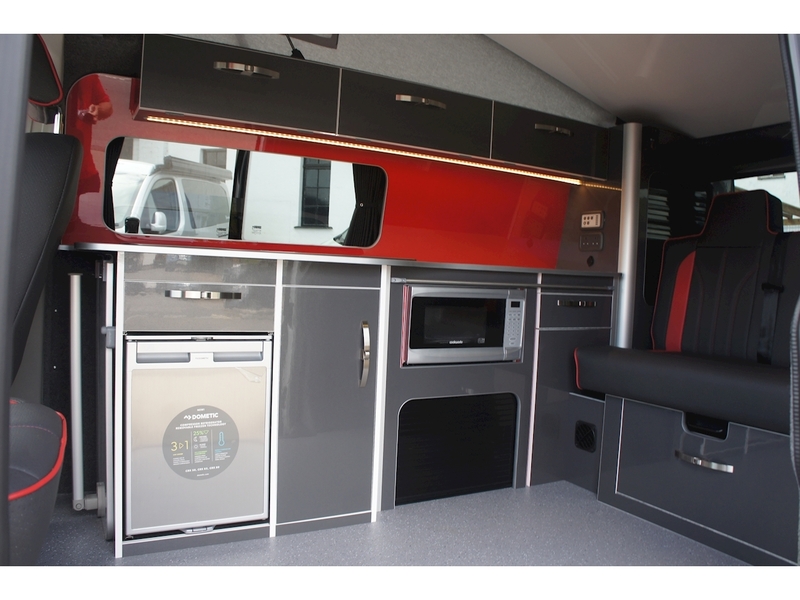 Propex hot and cold heating system, M1tested front swivel seat, 12v demetic compressor fridge with mini freezer, domentic twin gas hob, dometic gas mini grill, sink with 12v power tap and waste water outlet, power management system with split charger, 2 x 240v mains sockets and 1 x 12v power socket, tinted windows with black out curtains, LED under cupboard lighting, LED spot lights and 2 x LED reading lights in the roof top with USB charging point, removable fold away table, porta pottie storage, gas bottle cupboard, under bed storage and a hard-wearing flooring and lockable storage safe. 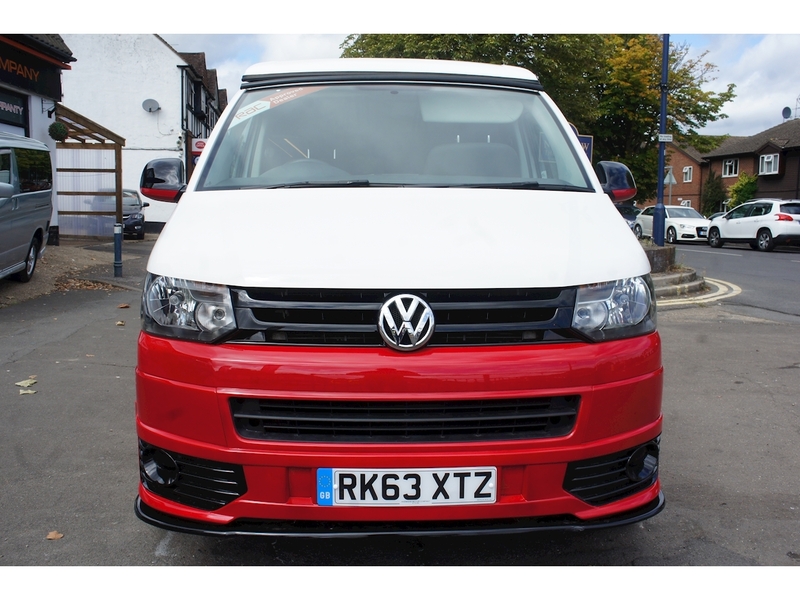 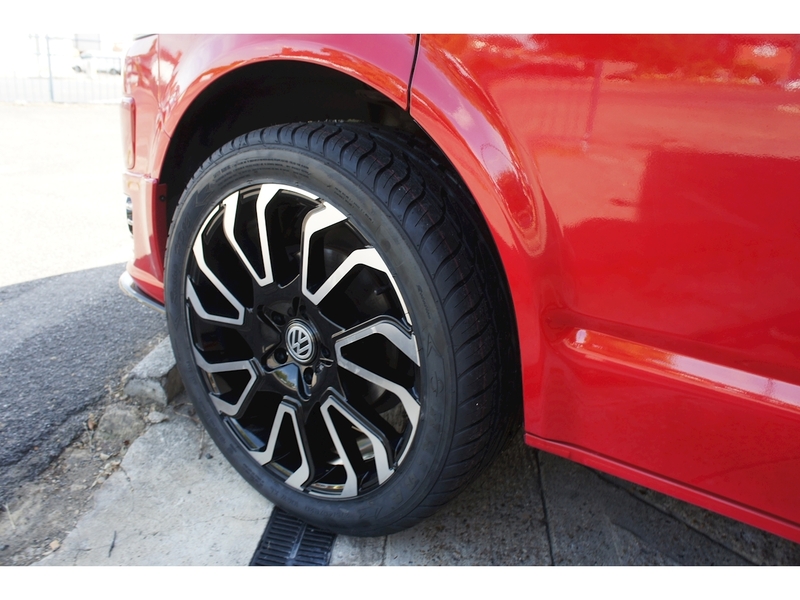 This vehicle comes with with a full RAC warranty and RAC brakedown assist for complete peace of mind.